Hey! What are you doing this weekend? It's the weekend before Valentine Day. Got ready for it or are you celebrating it early? 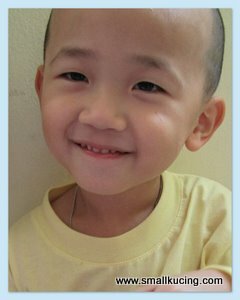 BookXcess is having Valentine Day Promotion. I know coz we went the last weekend. Saw they have packed some books in two and selling them for around RM24-90 only. 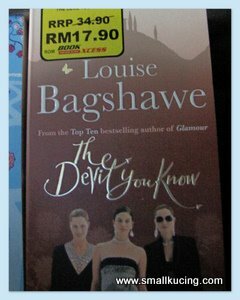 Two books for RM24-90..that's great. Mamarazzi wanted got grab some but tak jadi coz she had most of it already. But she did get some great bargains for herself. The book with the elephant cover cost her around RM6 only as it's one of the books being offered for February Purchase with Purchase discount(50% off). 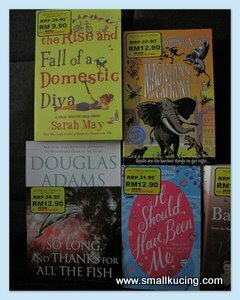 There were some pretty awesome kids, fiction and non-fiction books being sold at 20% during this Valentine Day Promotion. 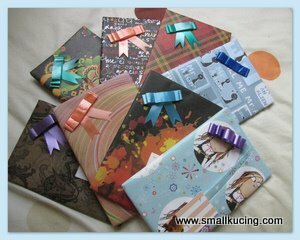 Free gift wrapping which includes wrapper, ribbon and gift tags were offered. Mamarazzi of course lah "kiasu". Bought some gifts for my little friends to be distributed later this month. See! They wrapped it so nicely for me. She is indeed a fan of Tilly Bagshawe and Louise Bagshawe's book. Bought this even though its at normal price. Well, she still get 5% member discount for the books. 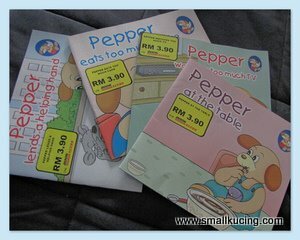 For me....hmm..these four "Pepper" books. Supposed to be five. There is one more "Pepper Goes To The Doctor", which she thought she took but only realised that she did not. Well, never mind lo...that is another excuse to go BookXcess again soon. Thanks for the info and will check it out soon. If time allow, I also want to go there. Not only eat mah...can give kids as gifts. aiks like that also need google?